Two-pocket heavyweight polypropylene portfolios / folders hold papers and resist tearing. Minimum purchase quantity is 36 units (one display). Two-pocket heavyweight polypropylene portfolios / folders hold papers and resist tearing. Features business card slot. Without prongs. Assorted primary colors include red, orange, yellow, green, blue, purple and black. Minimum purchase quantity is 36 units (one display). Hi. I'm John at C-Line. And today, we're going to talk about our Two-Pocket Poly Portfolios. These colorful folders are made from heavyweight polypropylene to provide durable protection for your paperwork and resist tearing. 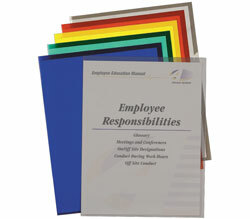 They come in an assortment of bright primary colors and the folders are both flexible and durable. Each folder has two large pockets to hold all of your papers and the front pocket has a place for a business card. C-Line's Heavyweight Two-Pocket Portfolios store presentations, reports, paperwork and more. They are great for home, school and business. Order yours now! That's all we have today. I'm John with C-Line. Thanks for watching.